Stay tuned for upcoming events for Dam Fundraising Dinner Germany in near future. 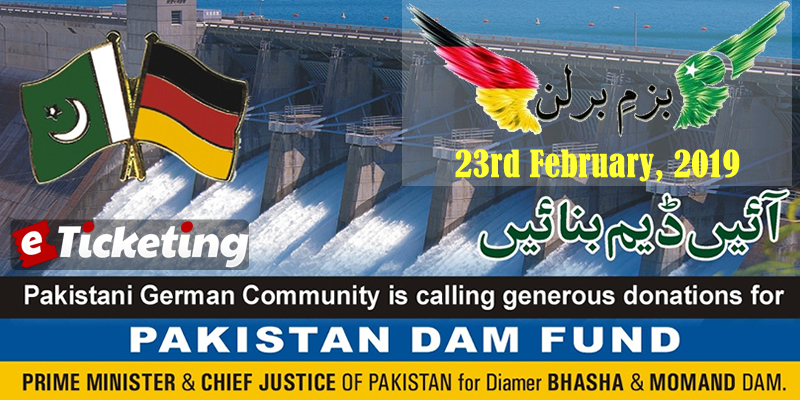 Pakistani German Community organizing a Dam-Fundraising Dinner & Pakistani Cultural Night. They invite wholeheartedly whole Pakistani Community to participate and take part in Dam Fund Donation. Wholly and solely Aim of the event is to bring Pakistani Community Together under Umbrella of National Unity, Solidarity and Harmony. 2) There will be Pakistani traditional Music (Qawali & Folk Songs) and Culture Entertainment. 3) Dinner will be served with delicious Pakistani Foods. Let's unite to save our Future and to make Pakistan progressing and prosperous. Bazme-E-Berlin is a Pakistani student organization for Pakistani community in Germany. Best Viewed at 1024 x 768 pixels and above. This Page loaded in 0.06684 seconds on Mon, Apr 22, 2019 (23:01).